Mental health is not a fixed trait but rather a dynamic state shaped by risk factors and protective factors. In a school that values positive mental health, everyone’s well-being matters. 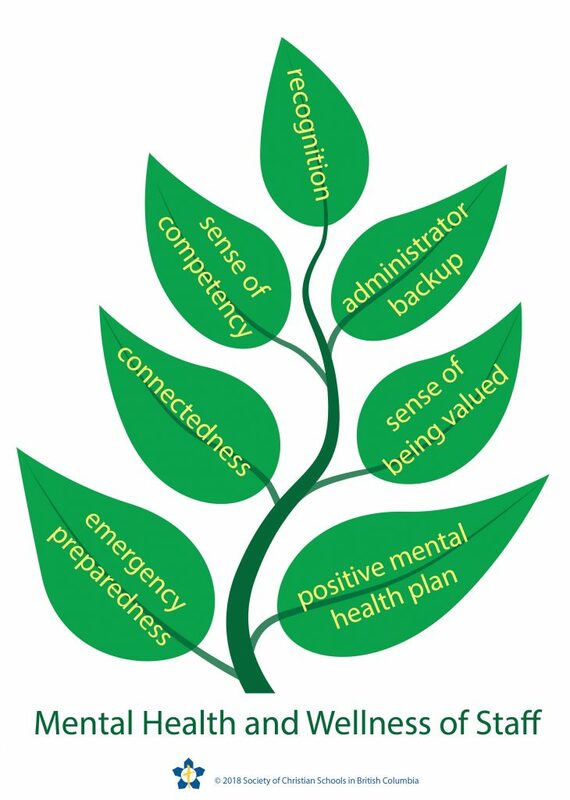 When school staff are mentally healthy, this has a positive impact on students, work colleagues and the culture of the school, creating vibrant and high achieving schools. The responsibility for staff well-being is shared between the school leaders and the individual staff. A school culture of good mental health for everyone starts with the individual. What can staff do to promote positive mental health? Staff can learn strategies to take care of themselves and become more resilient at work. Reducing and managing stress levels, maintaining positive social interactions and asking for help when needed are all helpful strategies. Being comfortable to ask for and give support reduces the fear of stigma for seeking help and is important in building a supportive and positive school culture. Maintain a healthy lifestyle, including eating well, taking regular exercise and keeping a regular sleep schedule. Practice calming strategies and restorative activities. Develop positive self-talk and replace negative thoughts with realistic and optimistic ones. Reduce and manage stress levels. Ask for help when needed and speak to someone you trust when you feel stressed-out and overwhelmed. Understand that taking responsibility for your mental health and well-being is key to your personal, professional and organisational health and growth. What can leaders do to promote staff well-being and mental health? The responsibility for staff well-being also rests with the school leadership. School leaders can take action to improve the mental health and well-being of all school staff by examining the factors within the school that may support or hinder staff well-being. Connectedness: Foster connectedness and social support among colleagues and promote collaborative and trusting relationships within a staff. Connectedness – the sense of caring for others and being cared for – is one of the most powerful protective factors in mental health. Have staff work in community, solving problems together, with everyone taking responsibility for each member of the school community. Provide team-building exercises that celebrate each other’s wins and support one another’s challenges. Examining and learning the role of anxiety in mental health. We live in a critical society, which may lend to supporting a negative belief system regarding ourselves. Provide training to help staff become aware of their thoughts and to address negative self-talk, and thinking traps will develop positive mental health and a positive school culture. Building a school culture of help-seeking and promote knowledge of well-being resources. Staff often feel like they need to be experts, so it makes sense to develop a sense of safety and willingness to be vulnerable and transparent in discussing challenges and asking for help and suggestions. Sense of Competency: Provide resources to help staff build their sense of competency and self-efficacy. Leaders can help staff let go of self-doubt and build on their strengths. Recognition: Ensure staff receive appropriate recognition for their work. Find ways to acknowledge and show appreciation to all staff and talk about the positive things you notice. Teacher Back-up: Should a parent or student become aggressive, leaders need to ensure they have the teacher’s back. This builds a sense of trust and safety. Sense of Being Valued: Ensure that staff feel heard and valued. Have regular check-in times with staff to see how they are and be available to all staff, circulating and being part of the community. Emergency Preparedness: Hold regular emergency drills and ensure that staff have regular training in school procedures for responding to emergencies and critical incidents. Responding to emergencies can be very stressful; training and practice will help staff to feel more mentally prepared and confident in responding to safety issues that may arise. A school with a mentally healthy staff starts with having a school-wide strategy to promote the positive mental health of everyone in the school community. It is critical that school administrators become champions of creating safe and caring schools for staff and contribute to staff connectedness, collaborative approaches and positive mental health awareness and practices. Improving staff wellness and positive mental health will improve learning and wellness for everyone in the school community. Bringing Mental Health to Schools, University of British Columbia.